Microsoft has confirmed what is expected with the OS version of upcoming Windows 10 major feature update with the release of the latest version of Windows 10 Insider Preview build. 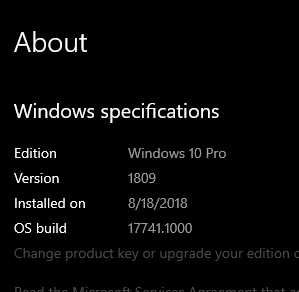 The next major feature update version of Windows 10 is labeled version 1809, which is now updated as the OS version in the Windows 10 Build 17741 released for Windows Insiders on the Fast ring. Previously, the OS version of Windows 10 RS5 branch continued to have OS version as 1803, the version number of Windows 10 April 2018 Update. The version number of Windows 10 feature update codenamed Redstone 5 (RS5) is widely expected as Microsoft commits to biannual update to Windows 10, normally on March and September. The Windows 10 OS version number is typically derived from the year and month which it’s ready for consumption. As such, expect Windows 10 version 1809 RTM to be available for Windows Insiders in September 2018, and general public in October 2018. Windows 10 Version 1809 is likely to be the last of the five Windows releases that has the Redstone (RS) codename. The next feature update release, scheduled to be released in March/April 2019, is codenamed 19H1, switching to date-based system representing the arrival in the first half of 2019. Windows 10 Build 17741 features mainly bug fixes and under the hood improvements, with the only major visible change being Your Phone app shortcut prominently displayed as desktop pin. Updated the Emoji Panel to now support search and tooltips for the Emoji 11 emoji that were added recently. These keywords will also populate text predictions when typing with the touch keyboard. Fixed an issue where the taskbar flyouts (network, volume, etc) no longer had an acrylic background in recent builds. Fixed an issue affecting certain apps where after quitting the app from its systray icon, the next time the app launched it would only display its systray icon (and not the corresponding open app window). Updating the image size limit for clipboard history (WIN + V) from 1MB to 4MB to accommodate the potential size of full screen screenshots taken on a high-DPI devices. Fixed an issue where if you opened Cortana and then clicked the Notebook icon before starting your search, then window would end up truncated. Fixed an issue where if Action Center was already open, Narrator wouldn’t announce incoming notifications. Fixed an issue resulting in autoplay notifications not appearing recently until you pressed WIN. Fixed an issue where if you received a toast, manually dismissed it, and immediately received another toast, you would hear the second toast ding but not appear. Fixed an issue where if Settings was open to “Bluetooth & Other Devices” and then minimized to the taskbar, when you tried to resume the app Settings would crash. Fixed an issue from recent builds where the first time you manually selected the date in Date & Time Settings, it would revert to Jan 1st. Fixed an issue resulting in the Min/Max buttons in the Microsoft Store app frame overlapping the app content if it was open when switching from tablet mode into desktop mode. Fixed an issue from recent builds resulting in share target windows (aka the app you select when prompted from the Share UI) not closing when you pressed Alt+F4 or the X. Fixed an issue resulting in IMEs not being able to type East Asian characters into forms in Microsoft Edge. Adjustments to improve the amount of CPU that cdpusersvc uses. Fixed the issue causing PCs to bugcheck (GSOD) when deleting a local folder that is synced to OneDrive. To receive and download Windows 10 Build 17741, join Windows Insider program and set to receive update in the Fast ring.